Whim Urban 30 is a new Whim plan. One of the biggest improvements to this is the integration of HSL 30-day tickets. This means that customers no longer need to activate single tickets each time before entering public transportation vehicles. Whim Urban 30 will have a special introductory price of 49 euros/month for the first 30 days (and thereafter will be charged at the regular price of 62 euros/month). For more information regarding all our plans, please see Whim Plans in the Capital Region. 1. You need to have a permanent address in one of the following municipalities: Helsinki, Espoo, Vantaa, Kirkkonummi, Kauniainen, Kerava, Sipoo, Siuntio, and Tuusula. 2. You will need to either authenticate with bank credentials or with a mobile certificate. Strong authentication will be done as part of HSL service (outside of the Whim app). During the process, you need to either log in to your existing HSL account or create a new HSL account. 3. Your HSL travel time entitlement should not be currently active in your (physical) travel card or in the HSL app. HSL app: Do you currently have the 30-day ticket active in the HSL app? → If yes, you cannot start the Whim Urban 30 plan, rather you will need to wait until the 30-day ticket in the HSL app has expired. Travelcard: Do you currently have travel time (as opposed to money balance) loaded on your card? 1. Update / Install the latest version of Whim from the App Store or Google Play. 2. Start the upgrade process by clicking the banner in the Home view or through Profile view in the app. 3. Press and start the HSL authorization process*. 4. Give MaaS Global/Whim authorization to handle things for you and log in or register to HSL account. 5. Confirm identification either with bank credentials or with the mobile certificate. 6. After the authentication process, you can finalize the purchase by choosing the area that you wish your ticket to cover. 7. You're ready to use the HSL 30-day ticket. The ticket will renew automatically every 30 days, according to the renewal cycle of your plan. *Note: Authentication with HSL account is needed so that HSL can verify your home municipality. This process should only take a few shorte minutes. 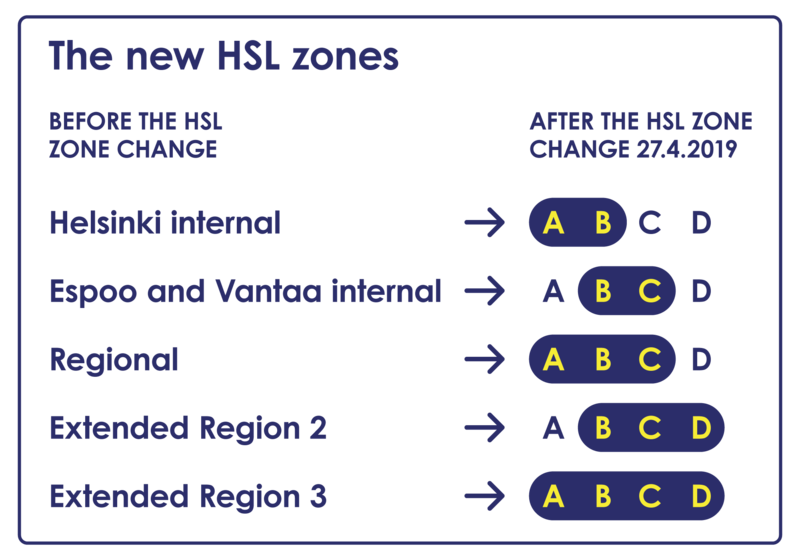 HSL zone renewal (Pic.4) takes place on the 27th of April at 04:30 (EEST). The old travel zones based on municipal boundaries are replaced with new zones. The zones are identified by the letters A, B, C, and D - see immediately below. (Pic.5) How old zone tickets will convert to new zones on 27 April 2019. The validity areas of tickets will either expand or remain unchanged after the zone change. If the new 30-day ticket does not suit your travel needs, you may change the zone tickets within the app. Please note that the change will take effect only on the next renewal. You can do this by going to the Profile view > My Plan > Change > Choose the zones and Subscribe until you get the notification that your plan will change. As a current Whim customer, can I change to Whim Urban 30 right away? As a current Whim Urban customer, can I continue with my current Whim Urban plan? Can I use the HSL 30-day internal ticket in more than one municipality, such as in both Espoo and Helsinki? What are the eligibility requirements for the HSL 30-day ticket? Why do I have to authenticate to buy a 30-day ticket? I am not a resident of the HSL area, can I subscribe to the Whim Urban 30 plan? I am a resident of the neighboring municipalities (e.g., Porvoo), can I subscribe to the Whim Urban 30 plan? What should I do when an error message appears during the verification process? What if the verification process fails even though I meet all the eligibility requirements? What is transaction-authorization on behalf of the user and how can I manage it? Can I purchase single HSL tickets for others, e.g., friends, while having a Whim Urban 30 plan? Do I need to activate the HSL 30-day ticket every month? Can I pause my Whim Urban 30 plan? I see that Vantaa is also launching city bikes in spring 2019. Can I use them with Whim Urban 30? Why is Whim Urban 30 priced at 62 €? I have received a notification about renewal failure. What should I do in this case? As a Whim Urban 30 customer, what should I do if I change my phone number? My phone is lost or stolen, and I cannot access the service. What do I do? I accidentally bought the wrong ticket. Can I get my money back? I forgot to terminate my Whim Urban 30 plan, can I still terminate it after renewal? What if after the automatic zone conversion, my travel needs are over- or under-served? As a Whim to Go or current Whim Urban customer, it is possible to change to Whim Urban 30 immediately. When the change succeeds, the unused days will be transferred over and the current Whim Urban customer will only be charged for the difference between Whim Urban 30 price and the unused days transferred over. Please note that as a Whim Unlimited customer, you will have to wait until the current plan ends if you change the plan to Whim Urban 30. With the arrival of HSL zone renewal, which takes effect on 27.4.19, the old single ticket based Whim Urban plan will be replaced with the Whim Urban 30 plan. Moreover, the current Whim Urban plan will no longer function after 27.4.19: it will no longer be possible to ride with the old plan. If you are eligible for the HSL 30-day ticket, we highly recommend you to update to Whim Urban 30 as soon as possible. If not, you are able to stay on the current Whim Urban plan until the 27th of April. The old single ticket based Whim Urban plan will continue to renew but only until 15.4.19.If on 27.4.19 you still have some days left on your old plan your plan will automatically be changed to our pay as you go option, Whim to Go, and the money from unused days will be returned to your original payment method. Before the HSL zone change, the HSL 30-day internal ticket will only allow you to travel in one municipality at a time. If you would like to travel to another municipality, you may purchase a single ticket within the app. After the HSL zone change, you can travel in the zones which are included in your plan. If you would like to travel to a wider area, you could purchase the zone extension tickets. For more information regarding the pricing of the zone extension tickets, please see here. 1) You need to have a permanent address in the HSL service area which includes Helsinki, Espoo, Vantaa, Kirkkonummi, Kauniainen, Kerava, Sipoo, Siuntio, and Tuusula. 2) You will need to be able to do strong authentication - either with bank credentials or with a mobile certificate. 3) Your HSL travel time entitlement should not be currently active in your travel card nor in HSL app. The reason for this is that HSL needs to verify a person's eligibility for the season ticket, i.e., that one is a resident in good standing in an HSL service area. To do this they require the bank ID verification to be sure that a given customer is who they say they are. If you are not a resident of one of the municipalities included in the HSL service area, unfortunately, you are not eligible for Whim Urban 30. You may, however, still continue the Whim service on our Whim Unlimited plan or our pay as your go option, Whim to Go. I am a resident of a neighboring municipality (e.g., Porvoo), can I subscribe to the Whim Urban 30 plan? Currently, HSL 30-day mobile tickets only apply to residents of the municipalities included in the HSL area, thus residents of neighboring municipalities are not yet eligible to use the Whim Urban 30 plan. The HSL municipalities include Helsinki, Espoo, Vantaa, Kauniainen, Kerava, Kirkkonummi, Sipoo, Tuusula, and Siuntio. If the error message “Ticket ineligibility” (Pic.1) appears, it means that you do not have a permanent address in HSL service area. Please submit a request in-app or via the web to the Whim Customer Care team, if you do have a permanent address in HSL area. The error message “Active season ticket” (Pic.2) indicates that the HSL travel time entitlement is currently active in your (physical) travel card or in the HSL app. You will need to wait until the HSL travel time entitlement has expired, then you can start the Whim Urban 30 plan. If the error message “Verification failed” (Pic.3) appears, it means that there is an error while verifying your eligibility with the HSL account service. Please try updating your plan again later, and if it still fails, please contact Whim Customer Care in-app or via the web. If the verification process fails when all the eligibility requirements are met, please try again via the app. Should this prove unsuccessful please submit a request in-app or via the web to Whim Customer Care team. Yes. Being a Whim Urban 30 customer, you will be able to purchase single HSL tickets for others who are traveling with you. No. The HSL 30-day ticket will be renewed automatically unless and until you discontinue your Whim Urban 30 subscription. Unfortunately, you cannot pause the Whim Urban 30 plan. Pausing or interrupting the plan can only be done by dropping to our pay per ride option, Whim to Go. Therefore, please ensure that prior to your plan's renewal you have made the change in the app to drop to Whim to Go. Once the plan is renewed it cannot be discontinued and you will have to wait till the next renewal date before you can drop to Whim to Go again. You can do this by going to the Profile view > My Plan > Change > choose Whim to Go and Subscribe until you get the notification that your plan will change. No. At this time only Helsinki and Espoo city bikes are included in the Whim Urban 30. Why is Whim Urban 30 priced at € 62? We are aligning our pricing with HSL (based on the new HSL travel/service zones - 59.70 € for AB/BC; 107.50 € for ABC; 115.80 € for BCD; 157.60 € for ABCD). And, in addition to the HSL 30-day zone ticket of your choice, we provide you for less than 10 € cents a day more Espoo and Helsinki City Bikes (purchased separately for 30 € per season, 5 € per day), our popular 10 € taxis within a 5-km radius, and car rental starting at 49 €. The renewal failure might be due to the reason that you have moved out from the HSL service zone. Please make sure that you do have a permanent address in one of the following municipalities: Helsinki, Espoo, Vantaa, Kirkkonummi, Kauniainen, Kerava, Sipoo, Siuntio, and Tuusula. Please also make sure that your HSL travel time entitlement is not currently active in your travel card nor in HSL app. After these, please try to resubscribe via the app again. Should this prove unsuccessful please submit a request in-app or via the web to the Whim Customer Care team. If you wish to change your phone number, please submit a request in-app or via the web to the Whim Customer Care team. Kindly provide us your new number, as well as your first name, last name, phone number, email address and the last 4 digits of your credit card for authentication purposes. If your phone is lost or stolen, please contact our Whim Customer Care team in-app or via the web as soon as possible. Unfortunately, it is not possible for a refund after the HSL 30-day mobile ticket is activated. You may change to the correct ticket within the app, but the change will take effect only on the next renewal. You can do this by going to the Profile view > My Plan > Change > Choose the correct ticket and Subscribe until you get the notification that your plan will change. Please always check the plan options carefully before purchasing the Whim Urban 30 plan. Unfortunately, it is not possible to discontinue a plan after it has been renewed. You may, however, discontinue your plan anytime before the renewal and it will discontinue by the end of the ongoing term. You can do this by going to the Profile view > My Plan > Change > Choose Whim to Go and Subscribe until you get the notification that your plan will change. If the new 30-day ticket does not suit your travel needs, you may change the zone tickets within the app. Please note that the change will take effect only on the next renewal.